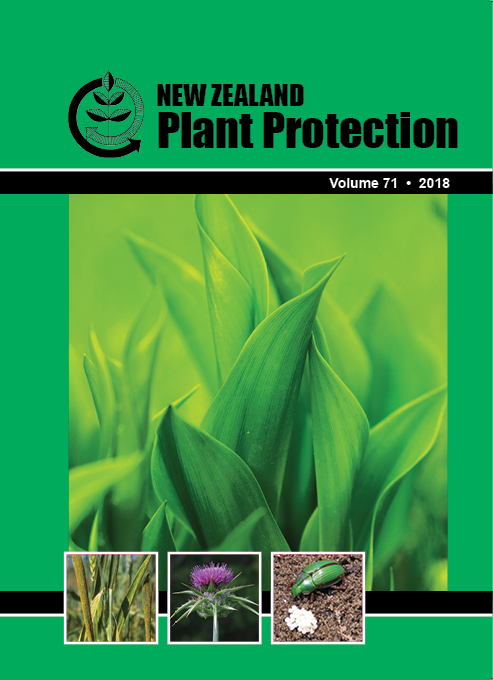 After the first detection of myrtle rust (Austropuccinia psidii) on mainland New Zealand in May 2017, the Ministry for Primary Industries sought information about how weather conditions would affect regional and seasonal risk of disease establishment to help plan the incursion response. Using internationally published information, a pathogen-process model was developed to predict infection, latent period and sporulation in relation to weather variables (temperature, relative humidity and solar radiation). This Myrtle Rust Process Model (MRPM) was implemented by the National Institute of Water and Atmospheric Research Limited using numerical weather model data to produce weekly maps of potential risk. Predicted risk was greatest in northern North Island and decreased further south, but was still substantial in coastal areas of the north-western South Island during summer and autumn. Risk was low in southern coastal areas of the South Island and the lowest risk occurred in mountainous areas, particularly in the South Island. Retrospective analysis of surveillance data showed that the MRPM accurately predicted geographic risk and it is currently in use for tactical planning of incursion surveillance and organism management.